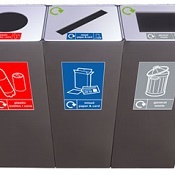 Cleverly designed waste paper bin and office recycling bin offering 2 compartments. Ideal for easy recycling and separation of office waste. Available in silver with choice of red, blue or green or black lid. 20 litre main section and 9 litre addition. See more from our extensive range in the recycling bin category.